How to choose a Make-up/Hair artist for your big day. After months of organizing all the details for your big day, everything should run like a well oiled machine. We feel it’s so important to have a relaxed, fun day and how it starts first thing is crucial to achieving that. Finding a beauty company that’s mobile and will come to you for your comfort and convenience is key! This allows for everyone to be together in one space as well. When choosing the right mobile company for your beauty needs, make sure their kits are equipped with professional brands = quality. Check to see if they have social media presence and a good website where you can view their work. A bonus point for offering airbrushing, lashes, hair extension application and tattoo coverage. Make sure they can work in a timely manner (average is about 45 mins a service). Book a trial ahead of time to get a chance to meet the people who will be doing your make-up and hair. It’s also important to click with them and to get along on a personal level. No bad energy welcome on your big day. Once you find the right fit (like The Glitz Galz 😊 ). Book them and make sure you sign a contract and pay a deposit to secure your booking. Start looking for your mobile make-up and Hair artists right away! We tend to book up quickly during wedding season (March-October). Try to book at least a year in advance. Bridal magazines tend to underestimate this timeline. Fell free to contact us if you have any questions. A brides make-up and hair has to stay impeccable from dawn to dusk and onward into the night. Needless to say, this is a very important aspect of bridal make-up. That’s why we want to share some key tips and tricks we’ve picked up over the years for making it last. Besides a little dab of powder and a touch of lip product your make-up and hair should be no maintenance on your big day. First, use a lightweight moisturizer that absorbs into the skin (give it a minute to absorb). Follow with a primer. Primer is key to making make-up last. We love Embryolisse. It’s French and it’s fabulous for all skin types. It actually doubles as a moisturizer so if you have a normal or oily skin type, you can skip the moisturizer and just use this. Eyeshadow base works wonders for longevity and helps prevent creasing. Urban Decay makes some really great ones. Another all time favorite are the MAC paint pots. Apply his before shadow but keep it to a thin coat. Too much product will have the opposite effect. Using waterproof concealer is a necessity. Weddings can be quite emotional, a few tears can break down the average concealer and leave you uncovered pretty quickly. We use Make Up For Ever waterproof HD Full Coverage concealer and it’s a superior choice. Also, powdering or “baking” isn’t needed with this miracle product so less chance of that ‘cakey’ look. Using a lipliner to fill in the entire lip first (can just be a shade that is close to your natural lip colour) is helpful as liner doesn’t come off easily and can still look natural. It acts as a stain and is even more stubborn if using a waterproof variety. Again, we love Make Up For Ever Aqua liners. set your entire face with a setting spray like Urban Decay’s All Nighter. This is magic! Keep hands/fingers away from your face and hair. Best thing for your hairstyle to remain flawless is not to touch it. Maybe add a light mist of a gentle hold spray (nothing sweet smelling if you are having an outdoor wedding) you’ll want to keep the bugs at bay. Following these steps will surely provide the confidence you’ll want knowing your beautiful face will last up until you finally have to wash it off. lastly, make sure one of your trusty bridesmaids is holding on to a pressed blotting powder, or blotting papers and your lip product du jour. these should be the only things needed throughout the day for touching up. Follow us for more beauty advice, tips and tricks! Summer is on its way, Hooray! We can’t wait to ditch our heavy winter gear and dark colours for lighter, brighter things. This is the same for our beauty regime. skin care products should be swapped each season for optimum skin health and make-up and hair styles can also be changed to reflect the hotter weather and all that comes along with it. First of all, SUNSCREEN! Let us not forget to apply this daily. At least an spf 15. Sunscreen should actually be worn all year long but most importantly in the summer months when the weather is the hottest tempting us to bask in the outdoors longer. Sunscreen should be applied half an hour before sun exposure (UV rays also exist in a lot of indoor artificial light as well). Make-up can be applied over top of your sunscreen. Here is our top pick this season: La Roche-Posay Anthelios 30. It won’t cause breakouts and it doesn’t feel heavy or greasy, YAY! Next, let’s switch up our make-up for something oil free and sheer. Complexion products, Opt for a powder and or a B.B. cream, try Bare Minerals Complexion Rescue and Maybelline Matte Maker powder. Heavy make-up just melts off, is suffocating to the skin and looks out of place in the bright hot summer heat. 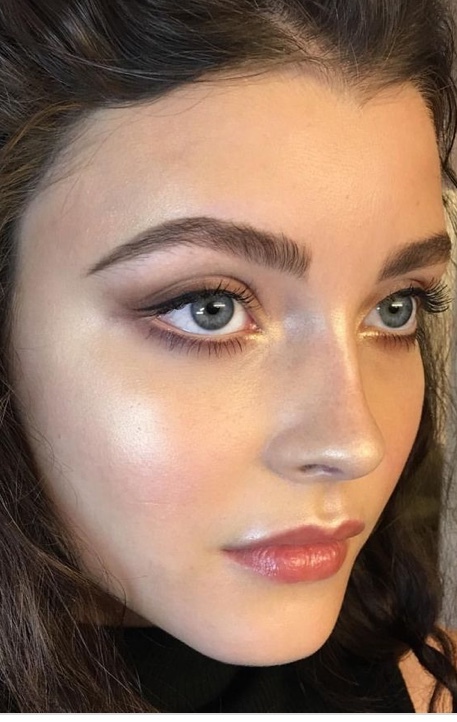 Fake a sun kissed glow with your favorite bronzing powder dusted over cheeks, top of the forehead and lightly across the bridge of the nose for a natural look. We love our GLITZ GALZ Golden Goddess bronzing powder compact. A bright lip paired with some mascara (waterproof if hitting a beach) is an all time favorite look this time of year. Quick and easy with an impact. Try these playful colours on: Make Up For Ever Bright Orange 40 or MAC Candy Yum Yum. •Make sure you remove all traces of make-up including stubborn mascara. •Clean off any traces of make-up remover (no oily residue on skin or especially around the eye area). •Optional but beneficial: exfoliate gently to remove any dead surface skin. Your make-up will go on much more evenly and it also gets circulation flowing, making your skin glow. •Moisturize your skin especially if you’re on the drier side. •Have your eyebrows groomed and all unwanted hair waxed, tweezed, threaded, bleached, whichever you prefer, 2 days before (NO LATER!). •Wash hair the day or night before and allow to either air dry or blow dry nicely. Keep it clean and not loaded up with product. •Refrain from the temptation to pick at any breakouts. Allow them to run their course. They are much easier to cover and much less prone to infection if they are left alone and not popped. •If you are planning on having hair extensions put in, make sure you have them to apply for your trial and definitely have them colour matched for your hair and professionally cut to appropriate length before your wedding day. •If you have any allergies make sure to inform the make-up artist and hair stylist about what products you tend to react to. •false lashes look amazing but we suggest if you’ve never worn them before to give them a trial run before you plan on wearing them to a big event. If you have any questions make sure to ask. We appreciate our clients asking anything they may be unsure about. Follow these suggestions before your make-up and hair appointment and you’ll be guaranteed superb results. Spring has sprung and what better way to feel it than to get a golden tan! We know how badly we’re all craving the sun but it can be damaging to our skin. Glitz Galz offer mobile vegan spray tanning to get the sun kissed look without the harmful rays. What better way to start breaking into our spring/summer wardrobe with the added confidence a tan can give? Not to mention the happiness we get from wearing all of our colourful lightweight options again. We also recommend booking a girls night tanning party for all our brides and their bridal parties before the big day. Having a nice tan can make the skin look flawless and hide any imperfections. Also, that white dress really pops on golden skin. Give yourself that boost and share it with some friends by booking a tanning party. What’s your shade? Golden or Porcelain? You might not wear make-up on a daily basis, you may wear very little or none at all but on your wedding day, it’s a totally different story. Your wedding day is coined “the best day of your life”, you’ll have pictures to document every moment to look back on for a lifetime. You will probably see friends and family that you haven’t seen in ages or possibly be meeting people for the first time. This often means that you will want to look better than you ever have and especially top notch in your photos. So even if you don’t ever wear make-up, you’ll be putting on the glitz ; ) for your big day. What looks natural in pictures will be a little more glamorous in real life. Maybe a brighter lip, potentially a bit more coverage on your skin and most definitely LASHES!! Okay, we said it! Definitely lashes. Even though it is an optional service, us Glitz Galz believe they are essential for brides and bridal parties. They make a huge difference in photos but still can look natural. Lashes also enhance your eyes which are “the windows to your soul” in which your future hubby will be gazing into. Lashes are especially great for the moms (MOB/MOG) because they give a bit of a lift as well as some definition and extra volume. We use a “Demi lash” for subtlety and they LOVE the results. if you have never worn lashes and don’t feel like you want to, reconsider for your big day OR at least give them a try for your trial. We’d be willing to put money on you deciding to wear them and finding a whole new appreciation for them to boot. believe us when we say that wearing more make-up than you ever would normally wear (including lashes) makes a beautiful impact and is undeniably worth it. You will have the photos of your big day forever and you will look perfectly fabulous in them. Almost all brides and bridal parties that we work with end up wearing lashes and never look back. Try them, you’ll love them. We know make-up and hair. We make your memories beautiful! Why do a trial run? There are many reasons to book a trial for make-up and hair before the wedding day. Even if you are extremely trusting, not picky and very easygoing it’s still a good idea to have a trial first. •You can meet the make-up and hair team ahead of time, knowing that they will play a part in your big day, setting the tone before you walk down the aisle. •You will have the chance to try the look and make alterations in advance. Time does not permit for this on the day and it could be quite stressful if sudden changes need to be made. •You have a chance to get opinions from friends and family. •An opportunity to see how the make-up and hair wear throughout the day/evening and how it feels. •The make-up and hair team can work more efficiently and be most effective if they know exactly what they are doing going in to it. •A bridal trial is the perfect opportunity to get engagement photos taken or for your bridal shower to make the most out of having your hair and makeup done. •Although it’s rare, it’s always a good idea to test out the products ahead of time to eliminate the chance of an allergic reaction on your big day. Most brides do book a trial but it’s fascinating that not every bride does. Your pictures are the memories you’ll have for a lifetime. How you look and feel in them is our number one priority.